Our mail slot is through our front door. This is the first house I’ve lived in like that and it’s always a little bizarre to come home with your mail scattered all over your living room floor. Yesterday when Jeremy and I got home this was laying on the floor. 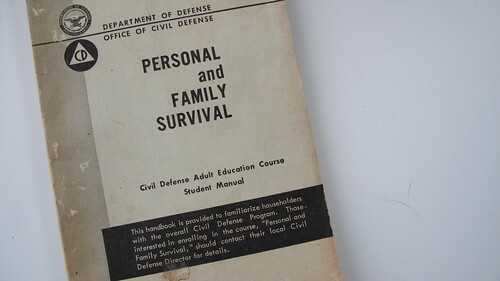 Department of Defense, Office of Civil Defense: Personal and Family Survival. 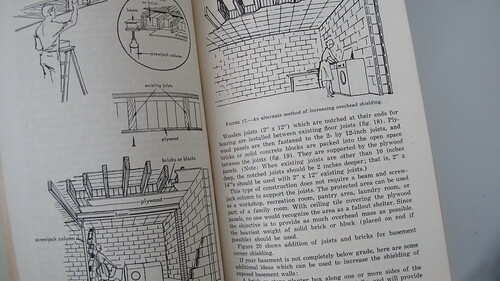 ©1966. Bizarre, right? This was either a total mistake or someone knows me really well because I love it. And I love even more that it’s a mystery who dropped it in our mail. 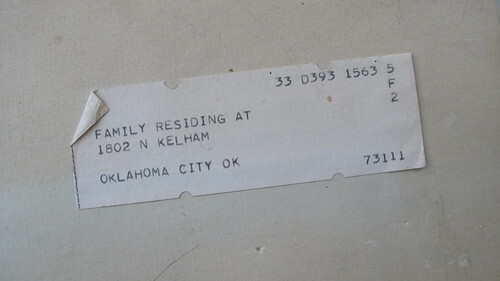 Oh and I googled mapped the address on the back of the book and there isn’t a house there – just an empty lot. A Mirror and a "K"
First, my sister picked up this mirror on sale at Target for Jeremy and I. It won’t be making a permanent home here on the mantle – we’re still trying to decide where it should go. 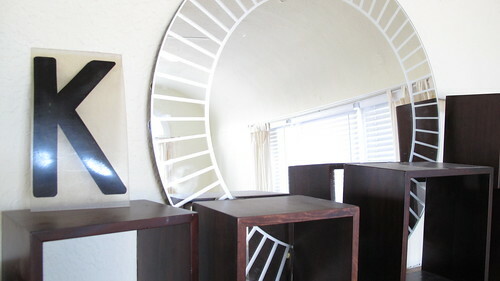 I’m thinking in our bedroom behind my jewelry cluster. Second, a friend of mine (and I won’t name names but her name rhymes with Shliz) obtains marquee letters (and I won’t say how) and I LOVE them. 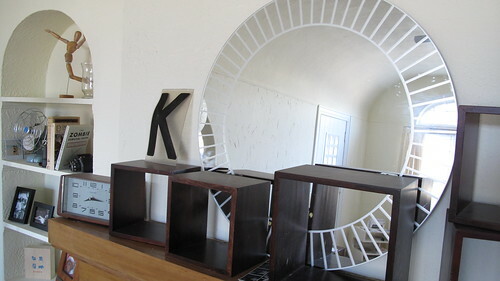 So the other night after celebrating Mardi Gras she got me this letter K.
Now we just need a J.
I just saw this image on sfgirlbybay of a lighter airy kitchen with stainless steel appliances. They pulled it off nicely! It looks like their solution to the sides issue was to add a cabinet facing to the side. We just don’t have the time or patience. Oh! And I should add that Jeremy and I are going to look into seeing what it will take to hook up gas to the kitchen so we can get a gas stove. First off, thank you everyone for your kitchen comments. Keep ’em coming because I’m still completely torn. Yesterday I was browsing for “vintage typography” on Etsy and stumbled across this lot. For $5.50 you get three random 12 X 1 1/4 inches cardstock prints. 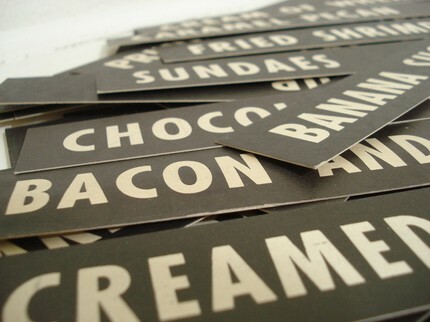 These would go great on our chalkboard wall in the kitchen. 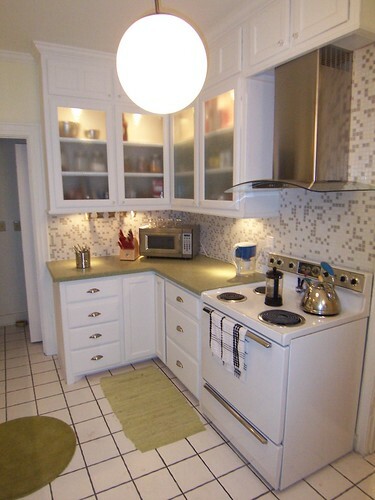 Kitchen Advice Needed – HELP! Jeremy and I need some serious kitchen advice. 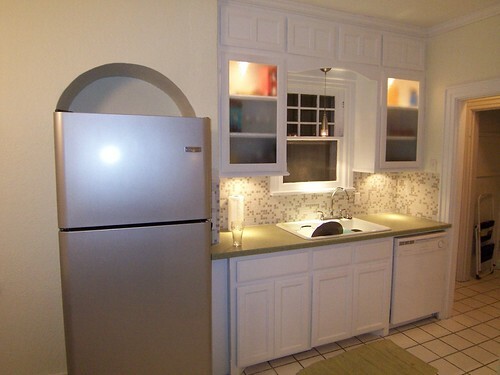 Stainless steel appliances or not? We are getting a new stove and dishwasher. Should we stick with white? Or go with stainless steel? Also – I should mention that all the images online that show a 3/4 view of stainless steel appliances have BLACK sides. That will totally break up the visual flow of our kitchen. 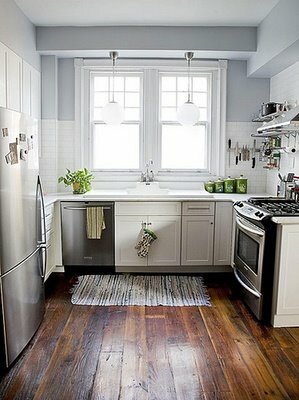 If we go for a white stove should we definitely get a white dishwasher?